An earthquake is a unique event that results in a number of peculiarities in terms of the mechanical behavior of buildings and, in particular, of masonry walls, to which the general criteria used in the structural analysis for usual action in situations due to load or wind cannot be applied. The main peculiarity is due to the fact that the effect of the earthquake does not result from direct action on the construction components, as in the case of wind, but is the result of an acceleration of the ground on which they are lying, and therefore, the intensity of seismic action is proportional to the mass or gravitational action on the element. In general, weight is a key element for the stability of masonry walls, however, in case of a seismic event, weight works against since it increases the effects of the attack. Another peculiarity of the effect of an earthquake, which turns masonry walls into especially vulnerable elements, is the impossibility for them to join in the movements of the elements they are connected to. Masonry walls are highly rigid if compared to any other structural elements. In general, rigidity is a desirable property for a good mechanical performance, however, when facing the action of an earthquake, rigidity becomes counterproductive if not accompanied by sufficient ductility. Design criteria for earthquakes are based on achieving the necessary stability to ensure balance and enough ductility to maintain integrity in the presence of important movements. The GHAS® system provides the right resources to achieve both of the aforementioned properties in masonry walls. These resources are the Geoanc® anchors and the Geofor® reinforcement, both with a specific anti-earthquake design which makes them particularly suited to face events of this nature. The Geoanc® anchors in the GHAS® system ensure the stability of walls against the tendency to fall over. 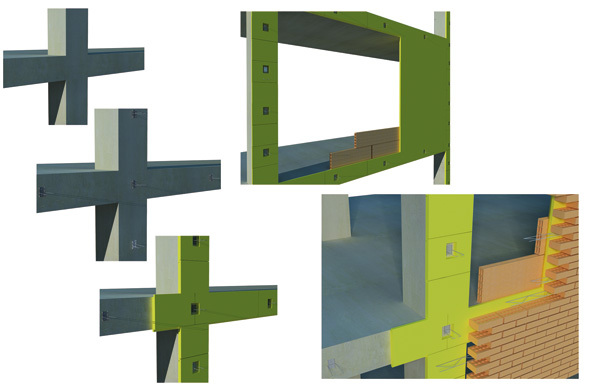 Their anti-earthquake design simultaneously provides two key benefits: HOLDING and UNLINKING. The ability of the Geoanc® anchors to resist strong horizontal actions allows for sizing by calculation, under current regulations, thus ensuring at all times the transmission to the structure of the forces caused by the earthquake. Furthermore, their geometric configuration with freedom of vertical movement, independent from the structural element to which they are connected, avoids gravitational cargo transfer, thus keeping the masonry walls free of the effects caused by the constraints imposed on the anchor points. The Geofor® reinforcement of the GHAS® System provides the ductility necessary to maintain the integrity of masonry walls in the event of strong movements. Its unique design provides masonry walls with three essential features for optimum response against earthquakes: STRENGTH, DUCTILITY and guaranteed STRESS TRANSMISSION. Sizing by calculation makes it possible to decide in all cases the amount of reinforcement which will be enough to resist bending in the walls caused by an earthquake. The geometry of the reinforcement in the form of a triangular lattice makes it particularly suitable to withstand significant shear effect arising from earthquakes. But the main feature of the Geofor® reinforcement is being able to guarantee overlapping, which is the prerequisite for the transmission of stresses between adjacent reinforcements. When the transmission of horizontal stresses is interrupted by an insufficient overlapping of the reinforcements, the desired strength or ductility of the wall is not achieved, even if the minimum amounts for these purposes are respected. For this reason, the Geofor® reinforcement is the only one on the market that really makes it possible at all times to ensure essential performance for proper behavior of walls subjected to earthquake action.